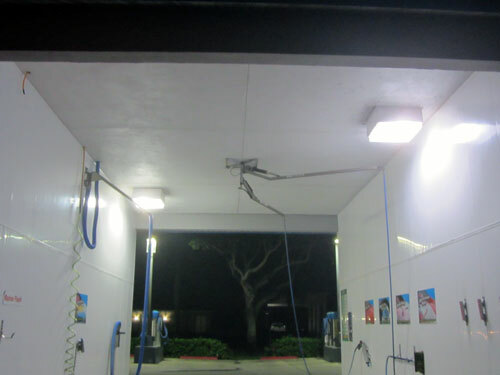 The hanging bubbles using 175 Watt metal halide bulb were replaced with 27 Watt LED Corn and for the top 250 Watt metal halide bulb used in the acorns used a 45 Watt LED corn bulb. Savings are about 85% and the brightness increaed 200%. 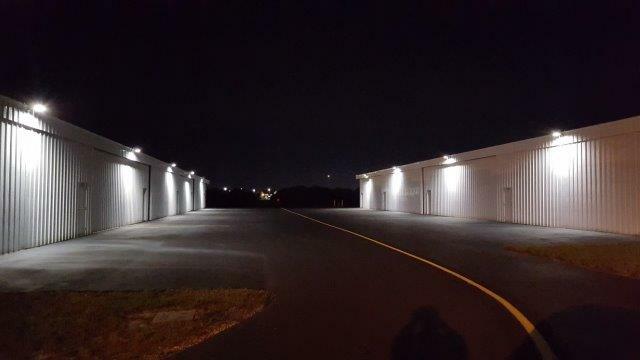 Hangars perimeter illumination using 50W LED Floodlights. 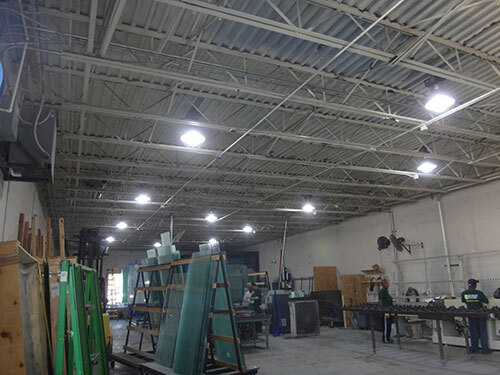 Replaced 1000 Watts HPS with 265W OMA street light fixture. This will save the city of Margate 77% in electric costs and about $100.00 per year per fixture in maintenance and parts. 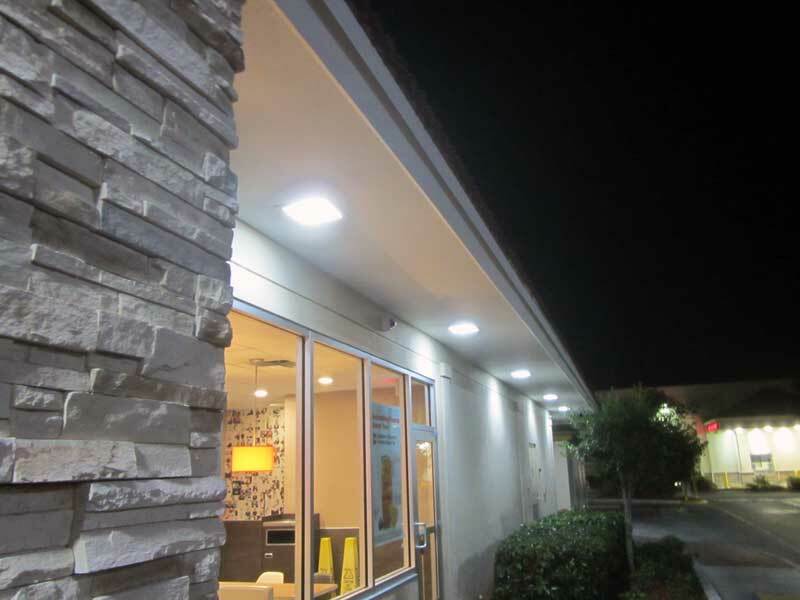 We are a McDonalds at Pebblebrooke in Naples Florida, changed all the bulbs to LED from LEDRadiant, in the building perimeter, the kitchen, the storage room and even the lights in the poles in the parking lot. Very happy with the change. 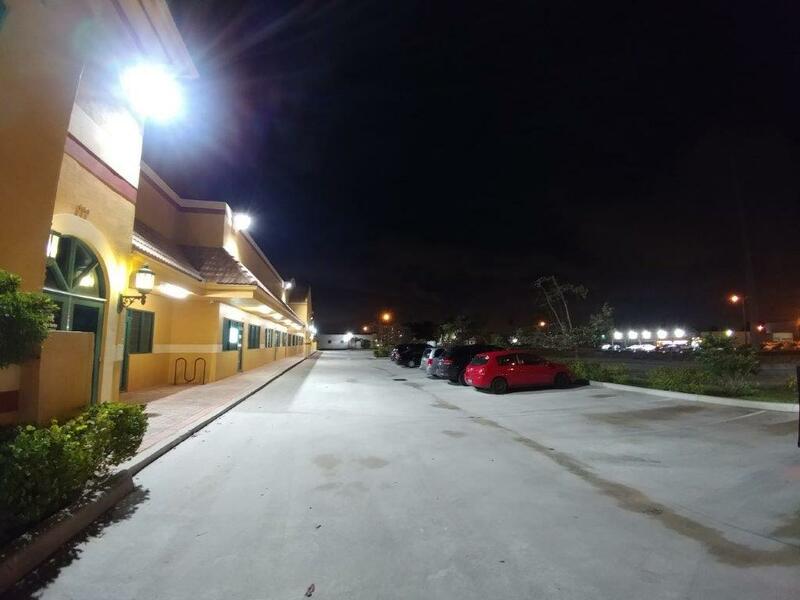 Using 22W LED corn bulb to replace 125W metal halide around the restaurante and in the playroom, 15W 4ft LED T8 Tube light in the kitchen and the storage room, 40 watts linear light fixtures for wet locations to illuminate the arch and 180W LED Street Light Cobra for the parking lot. 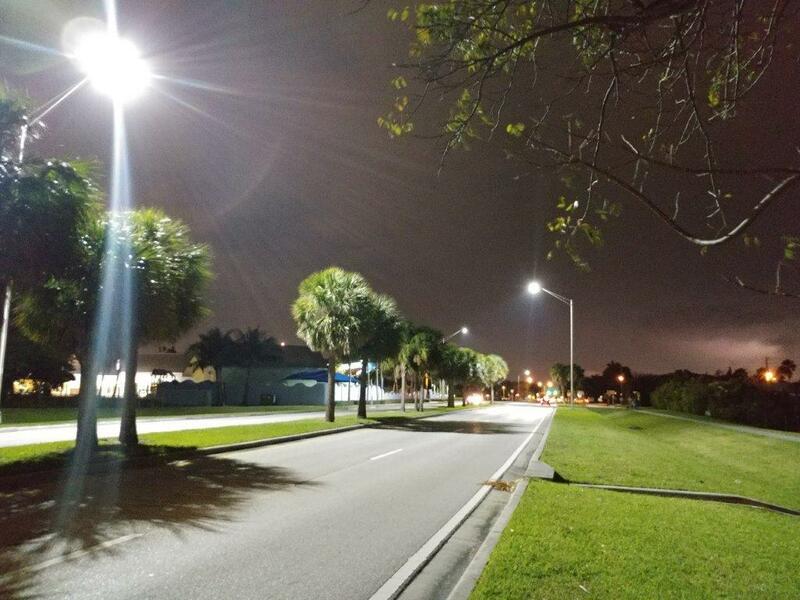 Replaced each one 1000 Watt Metal Halide at the top of pole and one 400 Watt Metal Halide at half the height of the pole with only one 265 Watt LED OMA series at the top. 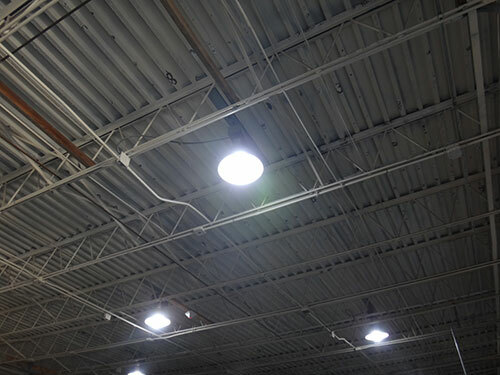 Counting the ballasts, about 20% waste, we went from 1680 Watts to 265 Watts saving 84% just in energy and thousands in maintenance. 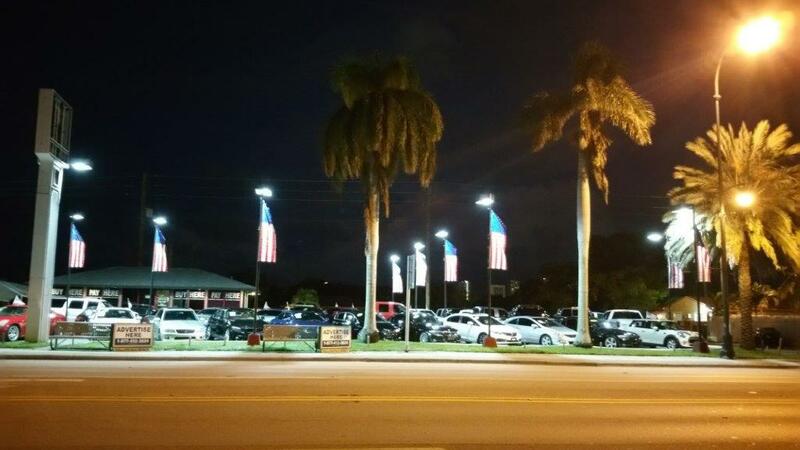 The dealership looks like a stadium. Outstanding. 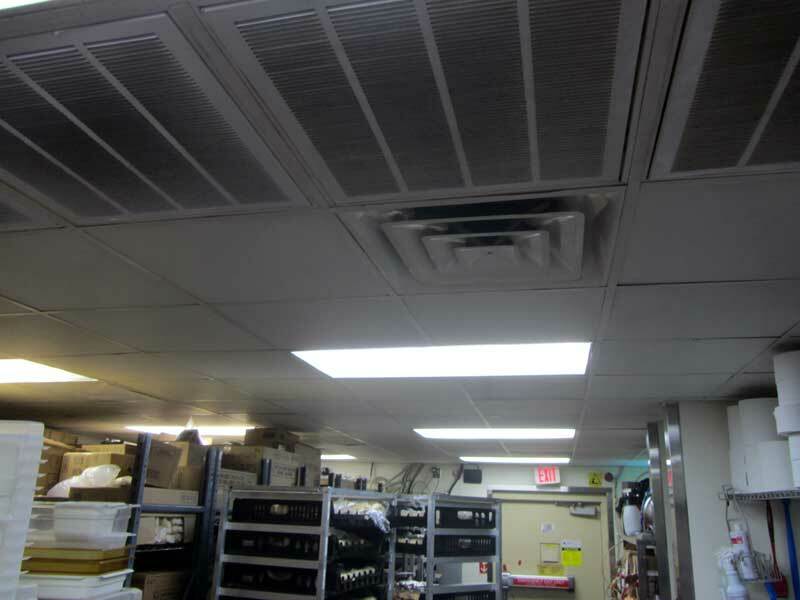 In that sector alone they are saving over $24,000 per year with 194% more light and near zero maintenance for the next 15 years. 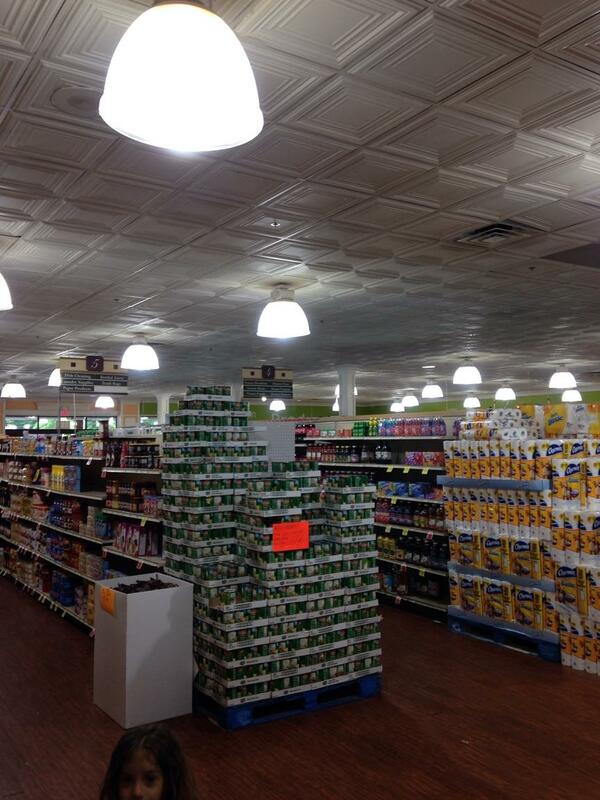 Replaced all 400 Watt Metal Halide with 100W LED 180° Semi Corn Bulb on every shoebox, which are 23 ft high. 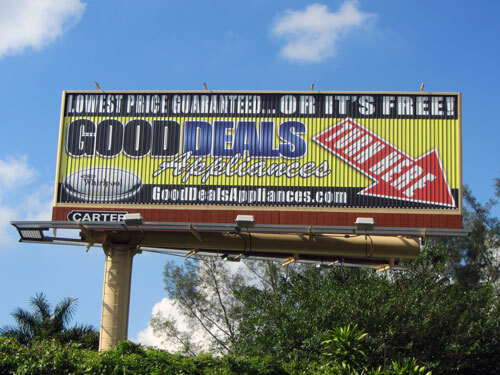 Savings are over 80% just in energy and thousands in annual maintenance. 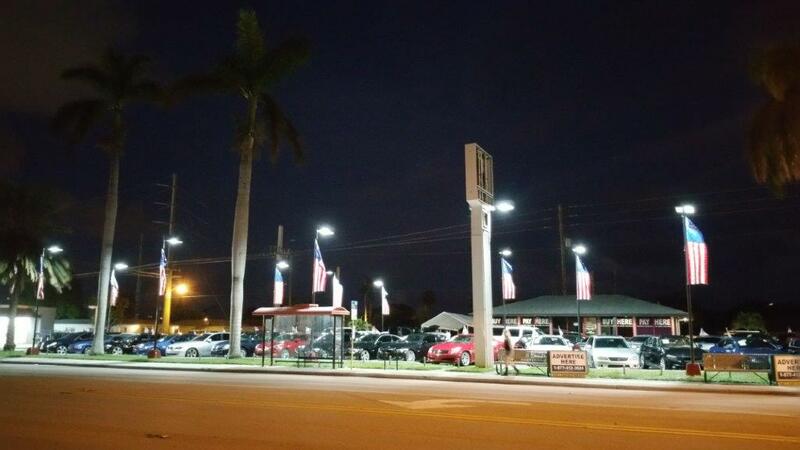 The dealership looks great as displayed in the images. 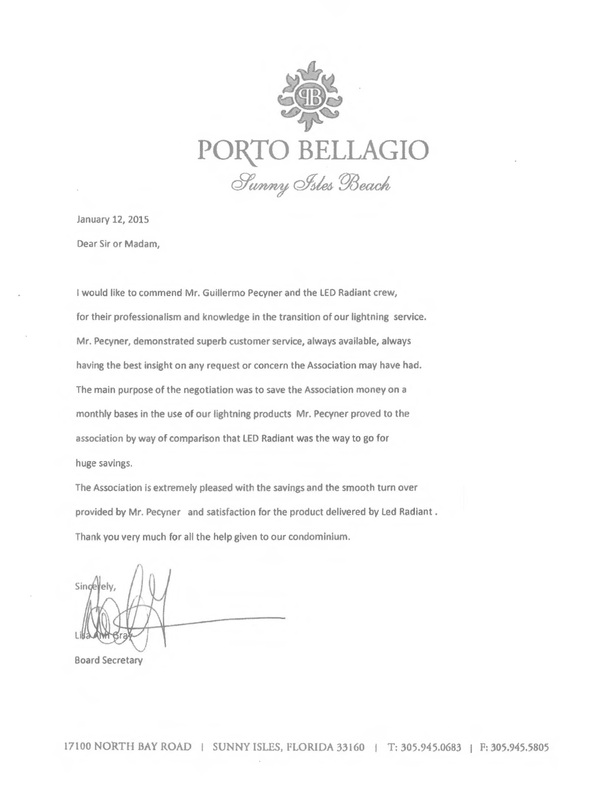 A full lighting renovation took place at these incredible beach hotel. 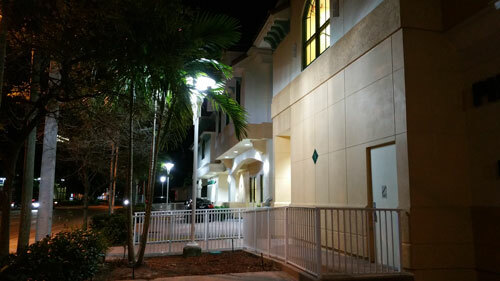 Halls PL's were replaced by LEDRadiant LED PL lamps, same as the sconces on the hallways. You can see them in detail HERE. 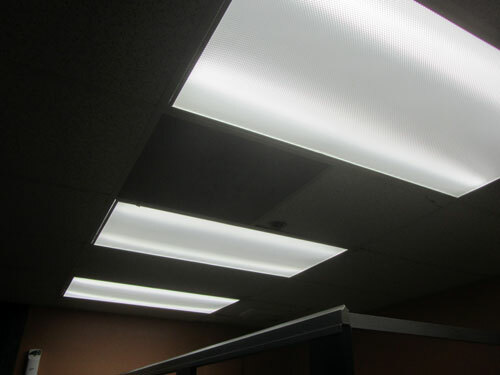 Standard 4 foot Fluorescent tubes were upgraded to LEDRadiant LED 4FT 100% plastic tubes. 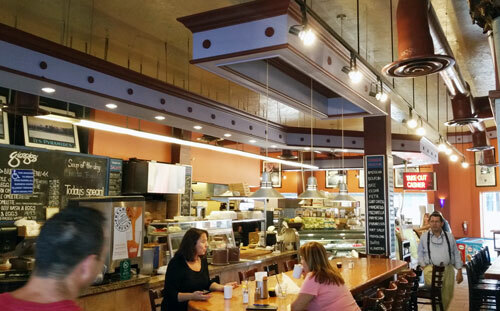 We have replaced the majority of our conventional lighting with LED replacements in order to reduce associated maintenance, increase light output and efficiency. 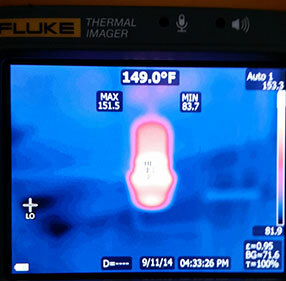 A competing LED supplier claimed that their product (at approximately 20x the price) was superior due to other bulbs not being designed for enclosed fixtures and failing due to heat. 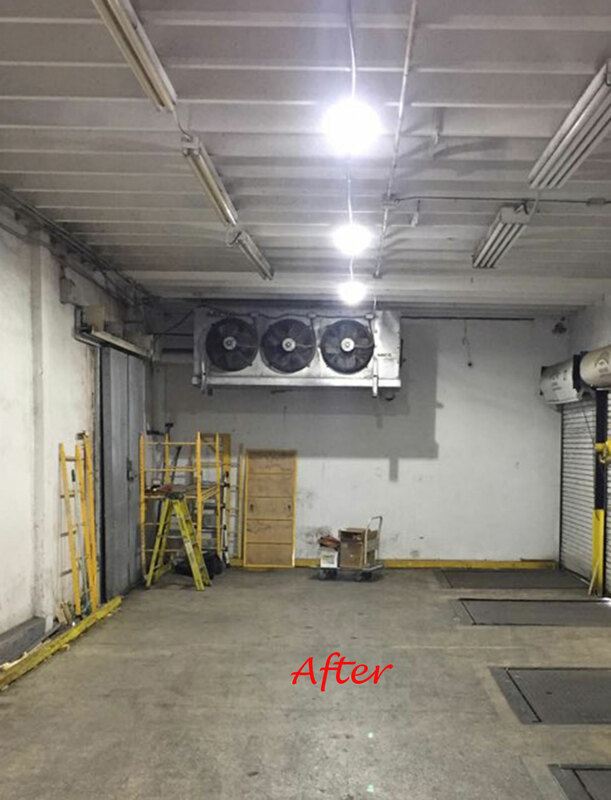 After a 3 month test period with one bulb, and some operational monitoring (see attached pictures), we started replacing the rest of the facility. 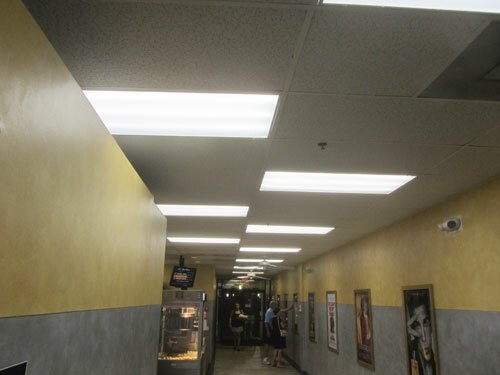 We have also started replacing bulbs at other facilities, as well. 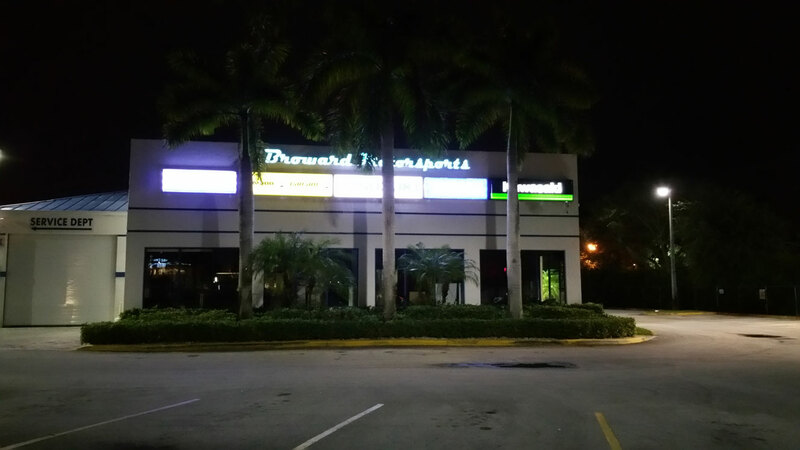 These 54W corn bulbs outperform our previous 250W Metal Halide bulbs, we are able to bypass nonfunctional ballasts instead of replacing them, and our lights now come on instantly. 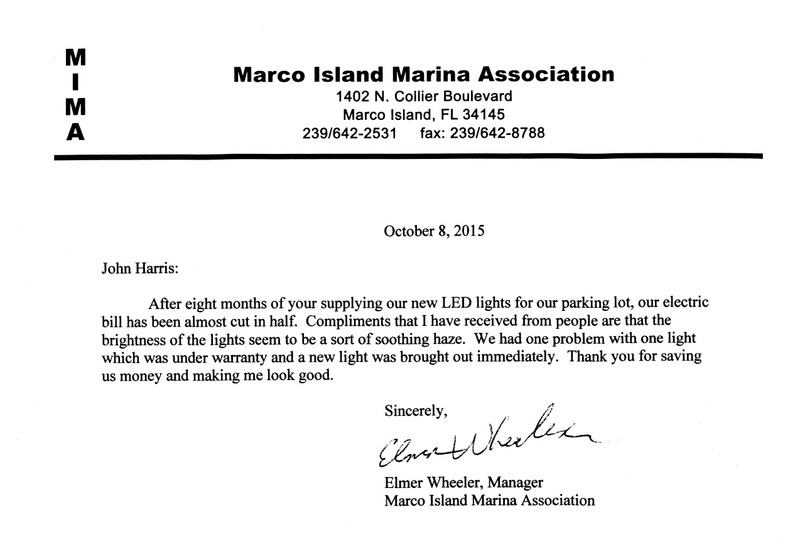 Our test bulb has been in service for nearly a year and we are thrilled with the results. 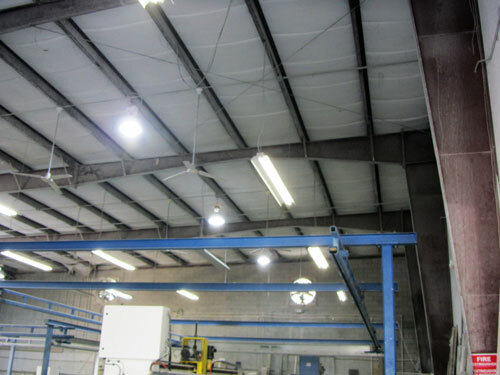 A total of 900 canopies (55W) were installed at this location to replace 3600 HO54 T5 fluorecent tubes that were burning a total of 213 KWh including the ballasts. 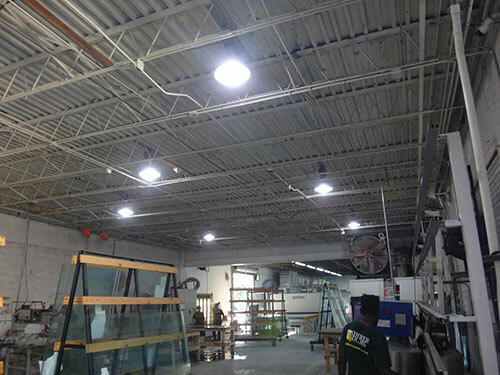 Maintenance required the replacement of tubes and ballasts. Total estimated annual cost $277,000. 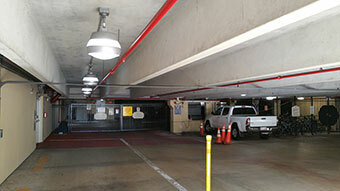 Now, with our 55W canopies, the parking garage looks like it has been completly renovated and cleaner. 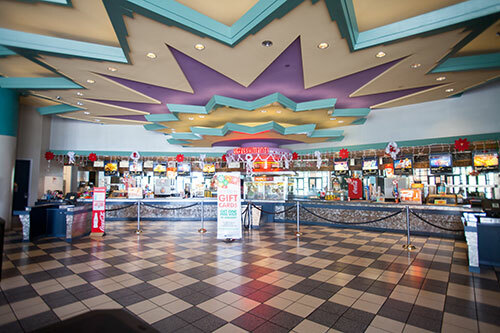 Total annual cost was reduced to $51,000 and maintenance to almost zero. 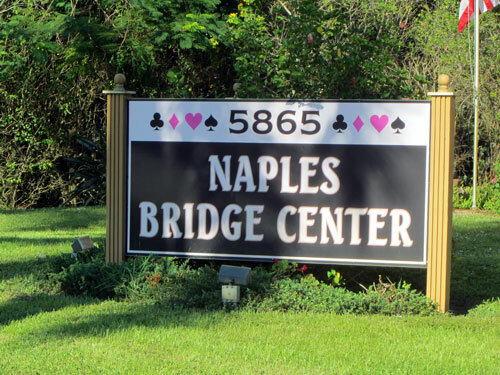 Annual savings $226,000. The investment is paid in less than 6 months. 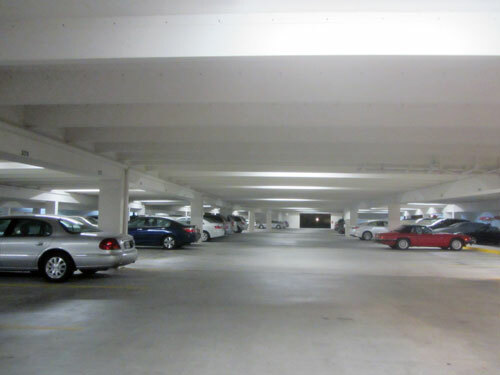 Take a look at the impresive facelift of this parking garage. 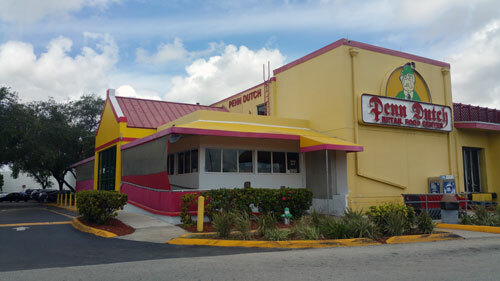 Images were taken while the replacement was taking place, see the difference. 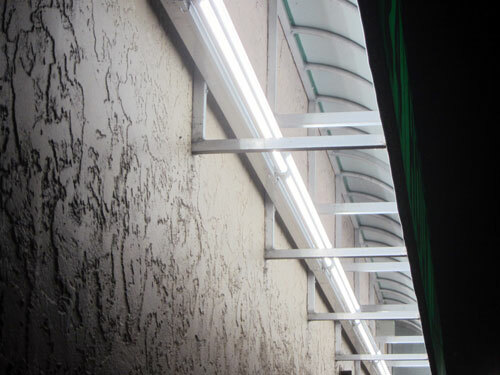 Time to take a look at our 55W LED canopies? 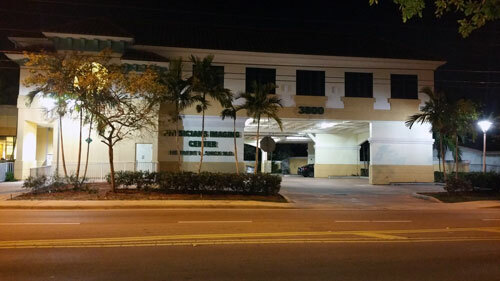 This cold store, the largest in south Florida was illuminated with 8 foot tubes. 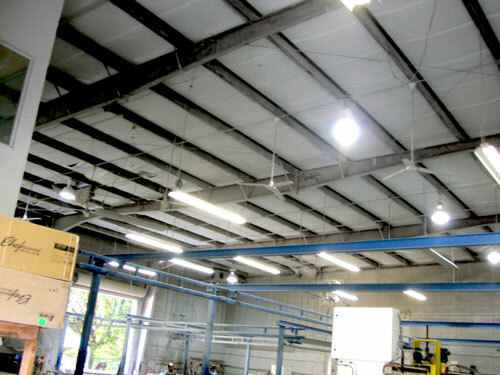 Every 4 tubes were replaced witrh our 55W canopies. 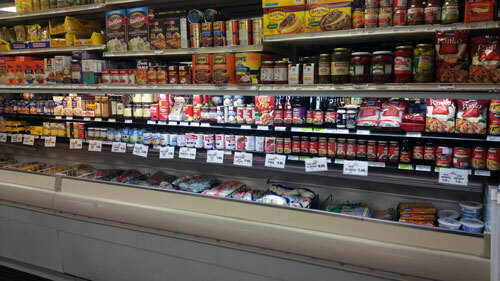 Annual savings over $13,674. The investment is paid in less than 7 months. 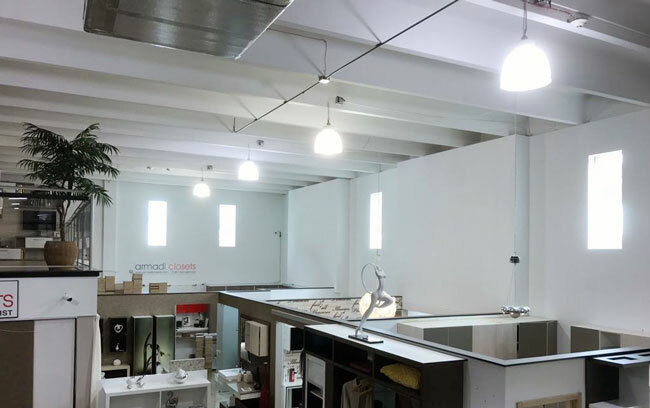 Take a look at the photos taken before starting the conversion and after finished. 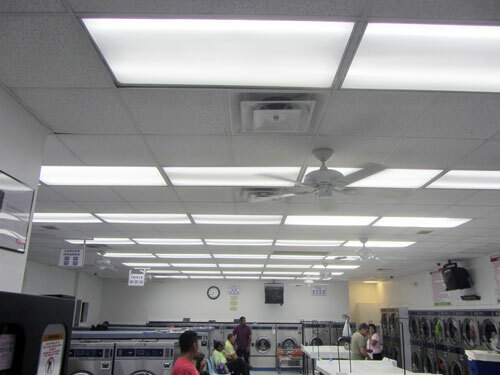 This top of the line facility center needed brighter lights so customers could feel more at ease. 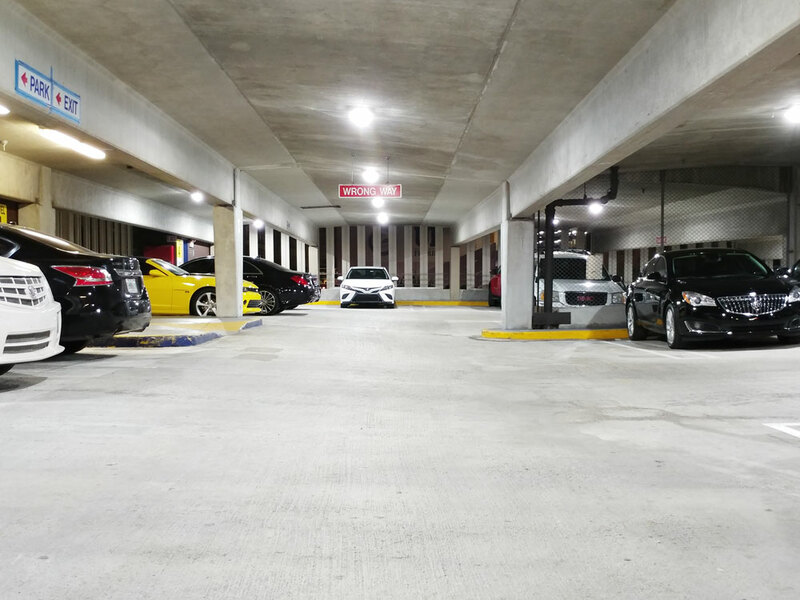 We also upgraded the Parking garage lights, with strong 22W LED Corn Bulb and the front facade street lights with 54W LED Corn Bulb, incresing not only the light but the security. 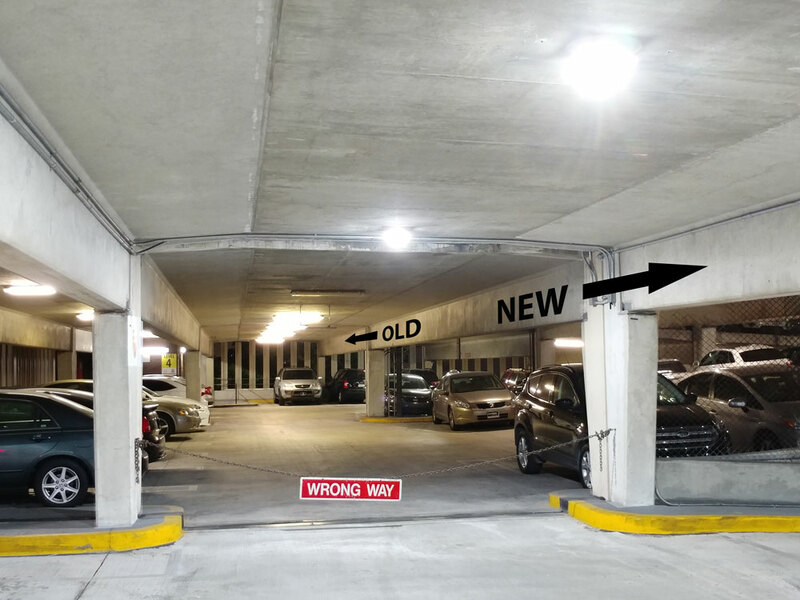 Finally, for the overhung at the entrance, inside the cans we install brand new LED Vertical PLs, same as the sconces installed in the Parking garage wall. 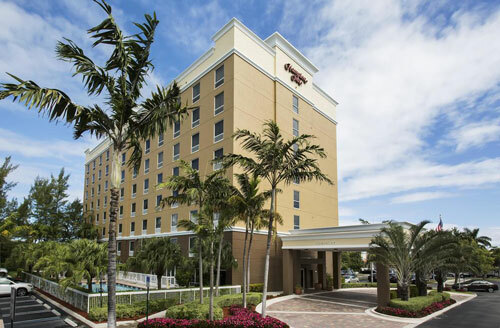 One Aventura is an office building located in Aventura, Florida. 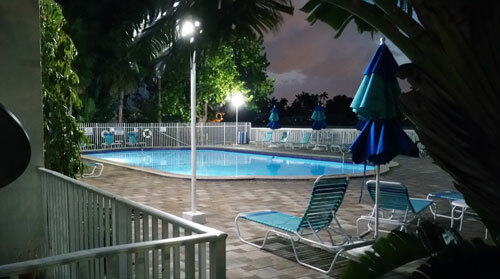 They were using 7 units of 1000 Watts floodlights that we replaced with 200 Watts LED Floodlights . 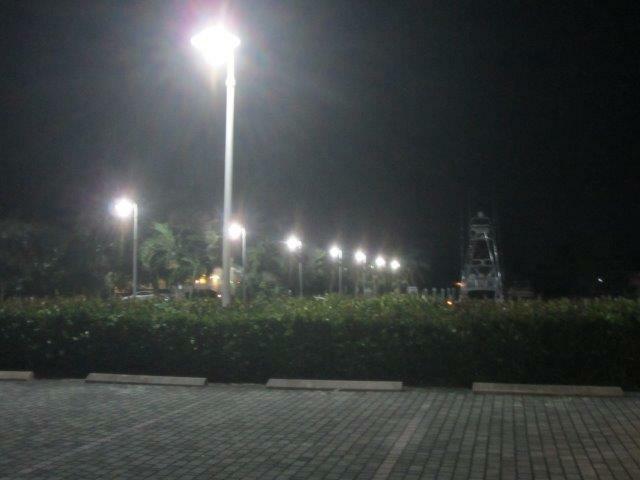 The metal halide bulbs used a ballast with a waste of about 180 Watts. With the replacement they are saving 7 Kwh, which translates in close to $290 each month just in the electrical bill and not counting the maintenance. 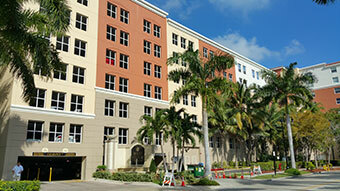 The investmet returned in less than 9 months and the building looks great. 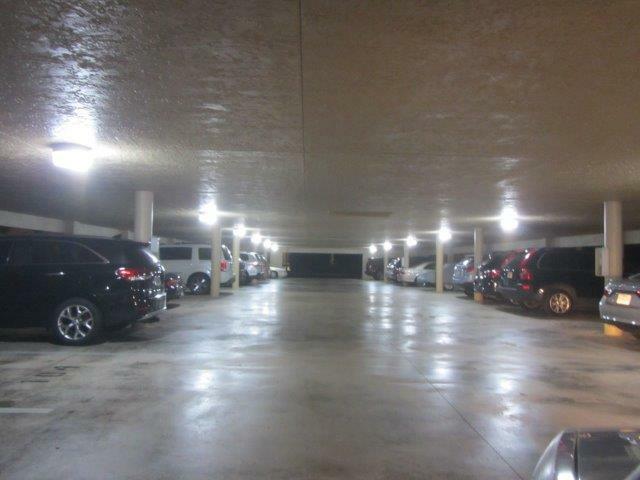 Replaced old wall pack fixtures with 1000 Watts metal halide with 200W LED Flood Light. 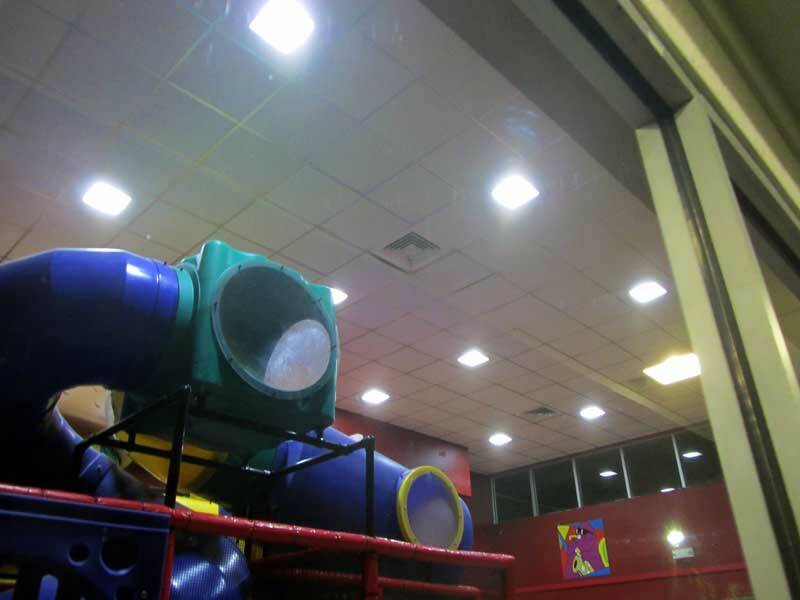 Even though the bulb is rated 1000 Watts, including the ballast consumption these were burning over 1200 watts, some lights were blue, some horrible green. 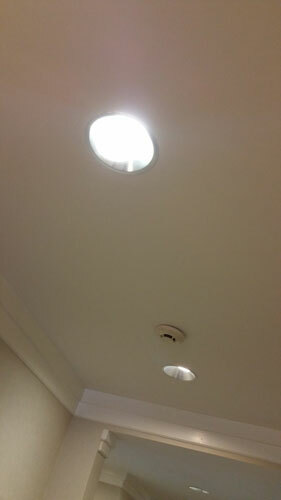 Now burning only 200 Watts and the place looks new, light color and intensity is even everywhere and extremely bright. 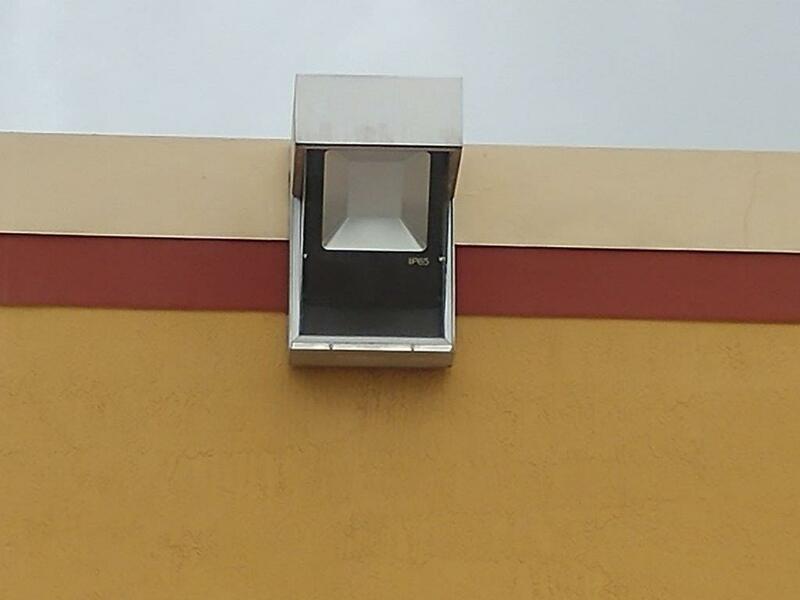 You can see that there is even a shadow where only the tubes are illuminating. 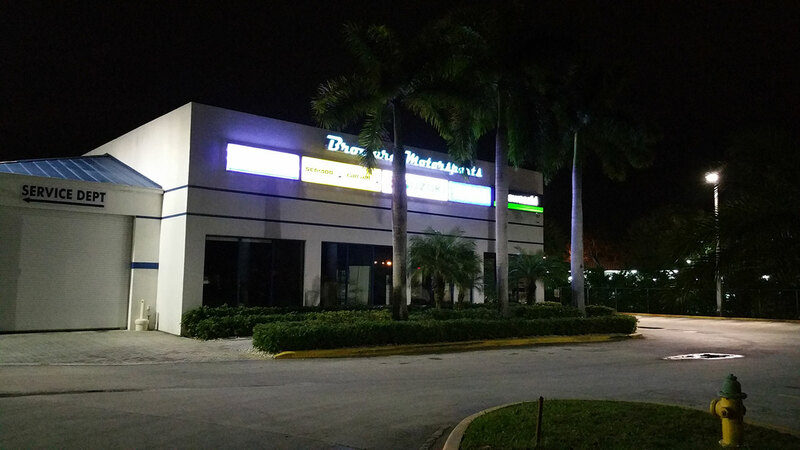 Broward Motorsports asked us for a solution to their signs because they have used some modules but they didn't last too long and wanted to replace those and other signs that were using 5 foot and 6 foot tubes. 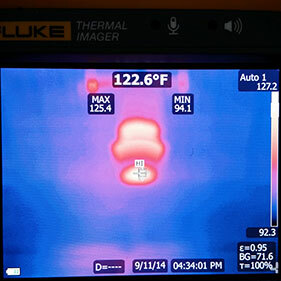 We suggested them to use 2.4 Watts/Ft. 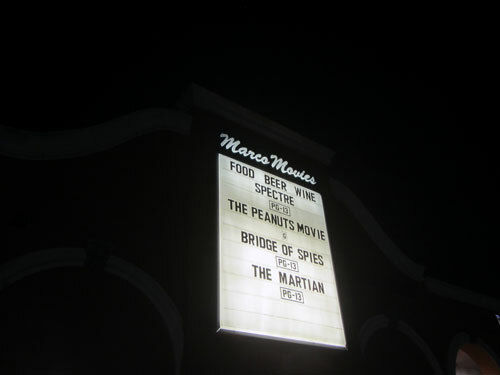 LED rope . This rope uses no transformers just a AC/DC converter that operates directly from the 120 volts is rated IP67, good for all weather conditions. 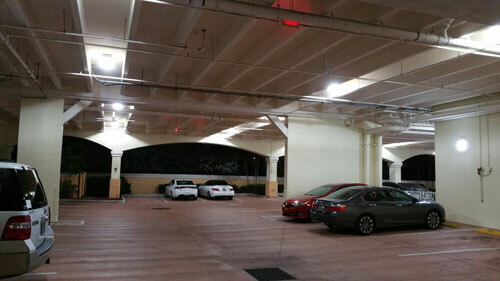 All retrofitted to LED with 18W 4ft LED T8 Tube light 2200Lm 4000K. 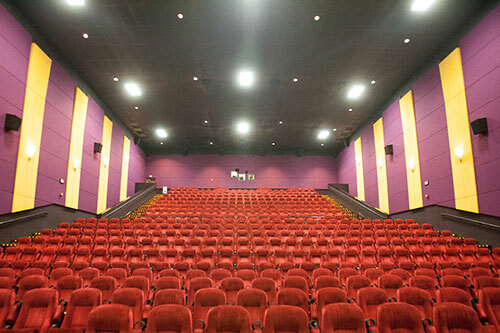 This movie theater renovated all the fluorescent tubes for our 100% plastic 2200 lumens LED tubes in 5000K. Now, customers can actually stop and read the posters...! 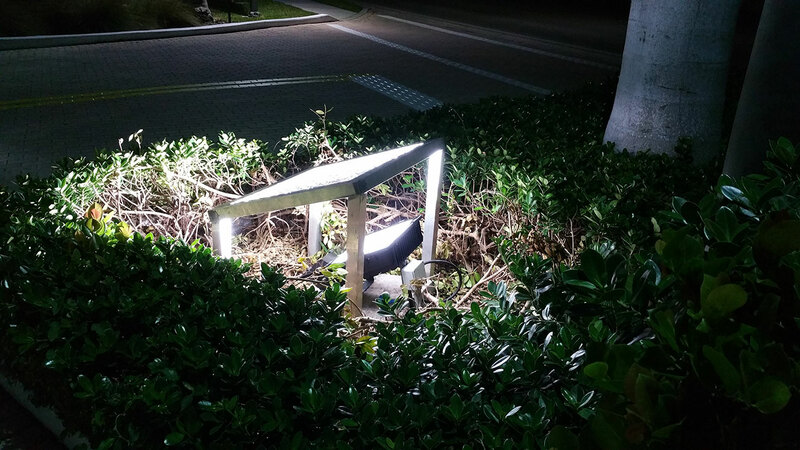 Using a 18W LED plastic tubes. 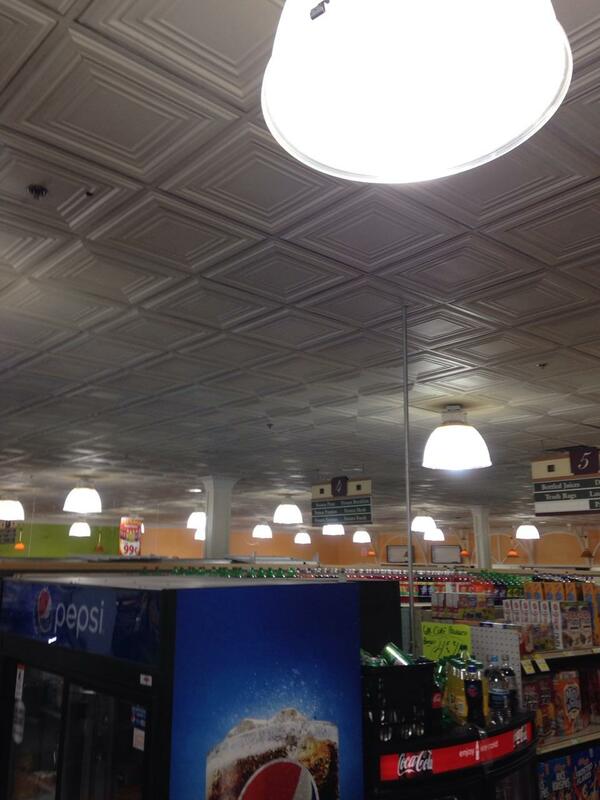 This supermarket decided to update all its lighting. 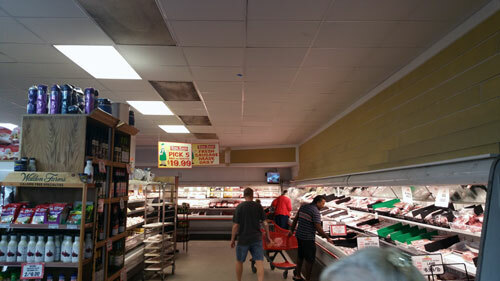 Different color temperatures for different applications and based in what was being iluminated: Meat goes with one color, produce with a different one, etc. 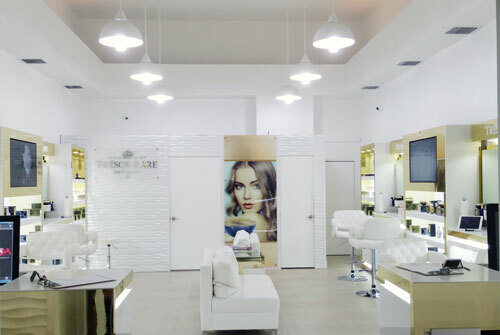 At the end a superb improvement to the general illumination of the place that translates into a lower electric bill and more sales! 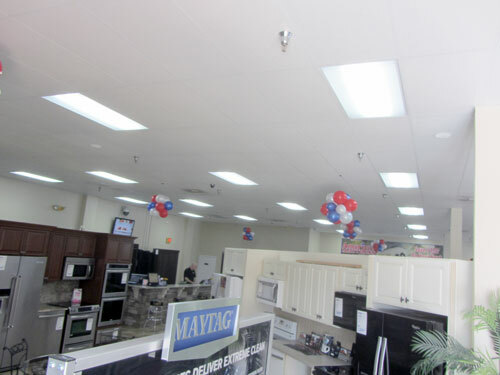 Using 2x4 50W LED Panels for general ceiling ilumination and 4ft LED tubes with specific color temperatures for the different kinds of refrigerators. 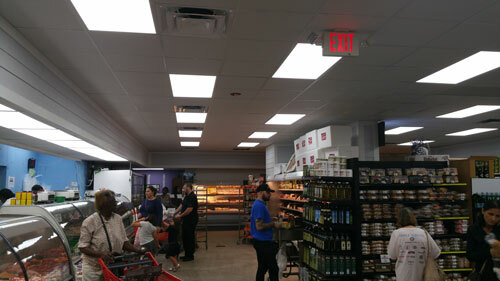 Brand new LED tubes for the fridges and 2x4 5000K panels for the ceiling. 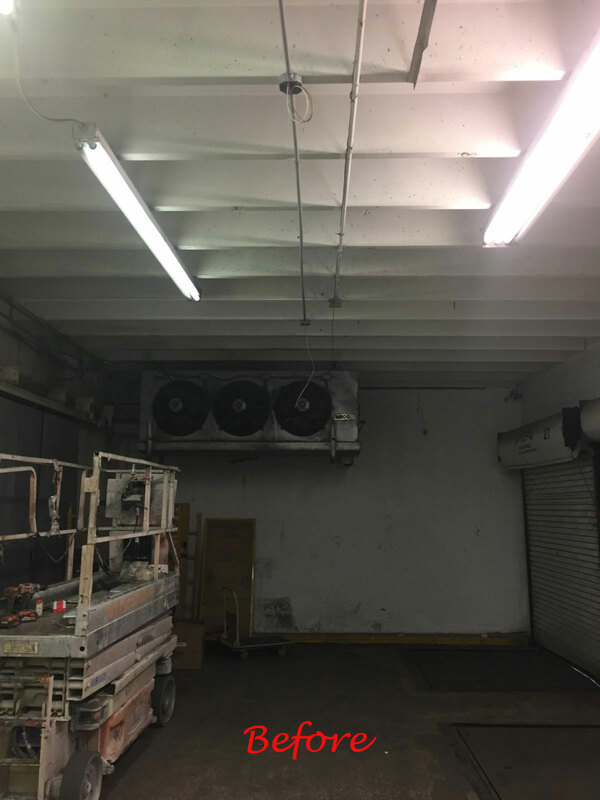 The customer was SUPER happy with the 100 and 120 w cobs and the site looks great! Using a 100W LED Corn Bulb inside an Acrylic Reflective shade. 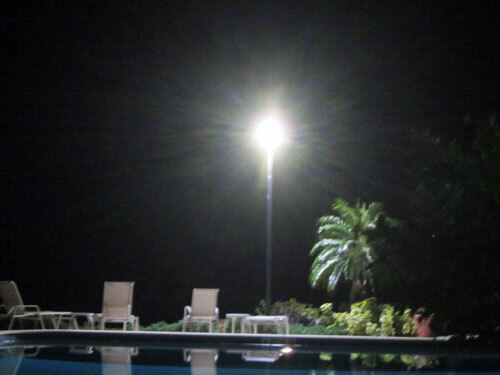 The customer retrofited from CFL to LED Corn Cobs 8 Watts! 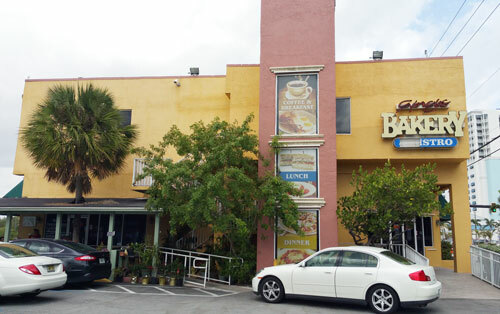 We are a bakery in Pompano Beach on a 10,000 square feet warehouse with troffers at 17 feet height. 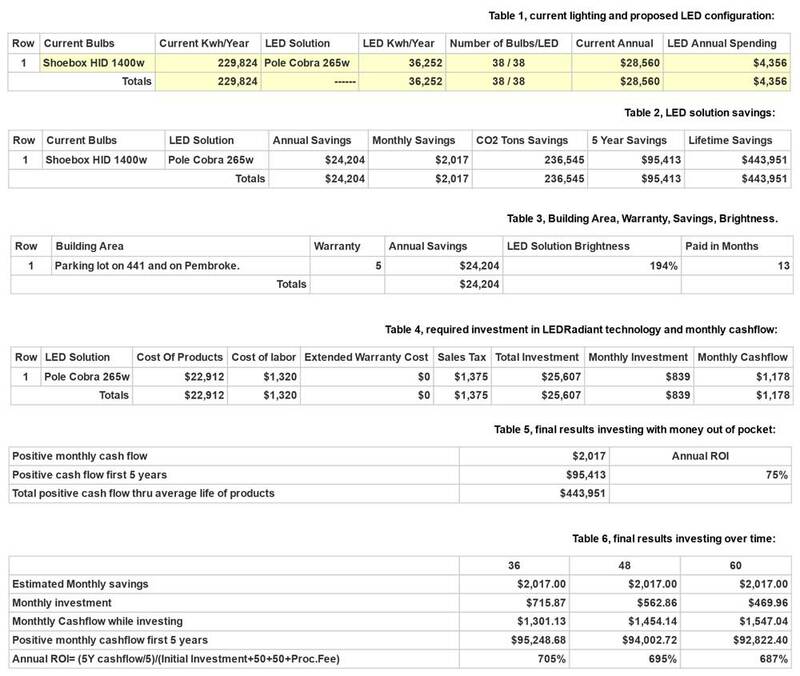 The Ledradiant consultant proposal said we'd save about 55%, but we got actually more savings. 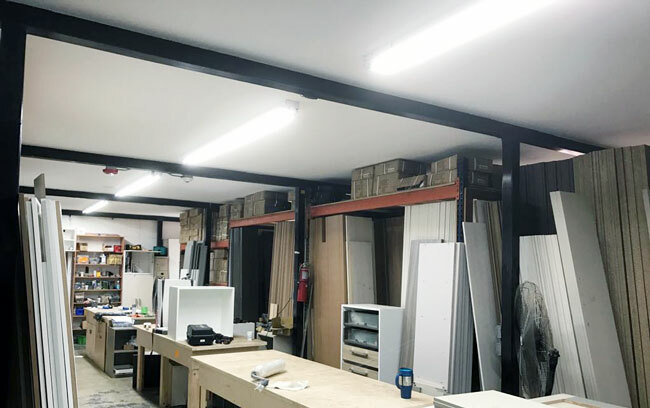 For each troffer in our warehouse we replaced 4 fluorescents with only 3 Ledradiant tubes, as these are much brighter than the originals. I'm a thechnical type of person, so I downloaded an app to my iphone to get a reading on the brightness under fluorescents and then under the LEDs and I read twice the light with only 3 tubes. 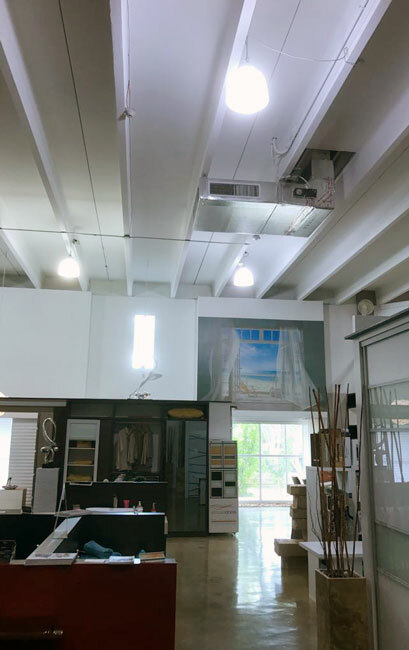 End result is we have twice the light with 18 x 3 = 54 Watt compared to over 160 Watt for the 4 fluorescents with ballast, so we are actually saving over 66% just in energy, not counting A/C savings, tubes replacement and maintenance. Very happy. 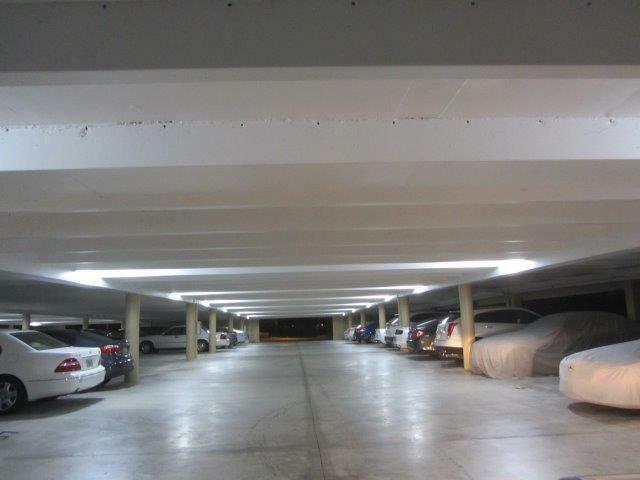 Replaced 4 4 foot tubes 32 watts each with 3 17 W LED T8 Glass Tube Light Frosted Lens 2200 Lumens 4000K Plug And Play. Outstanding bright white 54w corn cobs! 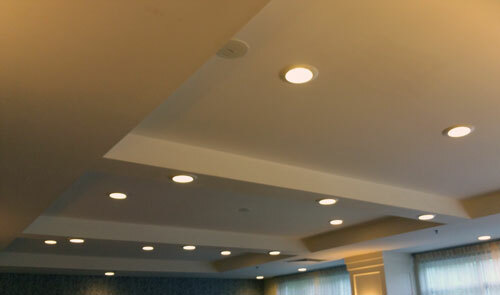 Using a 54W LED Corn Bulb 5000K. 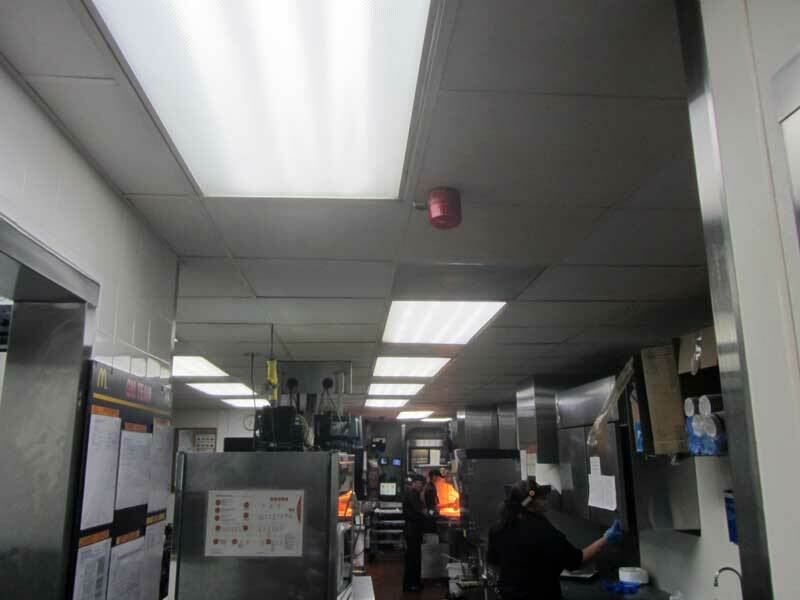 These canopies were retrofitted with powerfull 54 W bright white corn cobs! Using a 54W LED Corn Bulb 5000K. 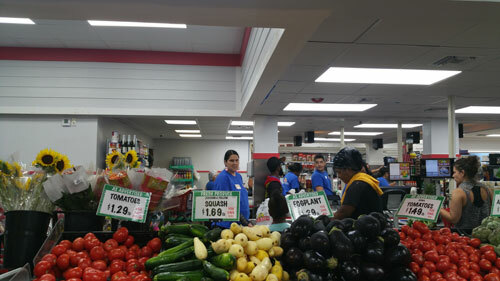 We used 200 Watt CFL and replaced with 120 Watt LEDRadiant corn bulbs. 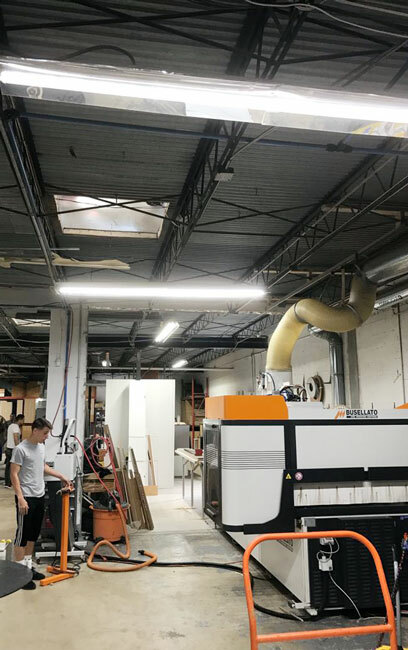 We do not care so much about the savings in lighting, which are about 40% because we have machinery and ovens using 100 times more power, but we can do our job much easier. 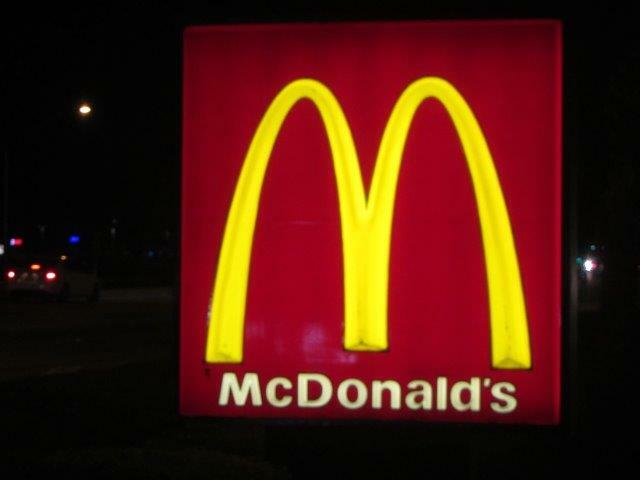 All the workers are happier and work more relaxed. 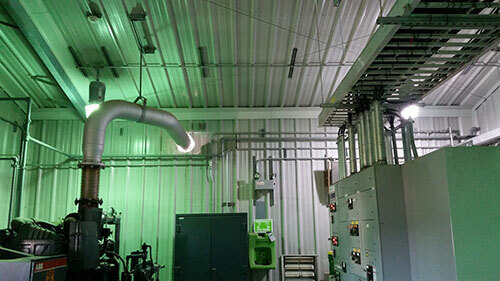 By retrofiting the customer optimized his workforce by providing a safer environment to work at the same time that reduce drastically his electric bill. Tubes, Corns and reflective shades were the to go option for these manufacturers. Eddy Thank you very much for showing me the way of more light for my facilities, saving money in the future with a small investment today. 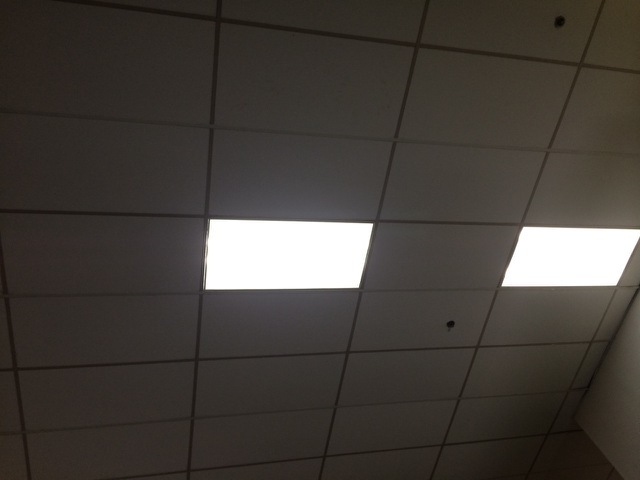 In the future will be changing all of our fluorecent light for led ones. 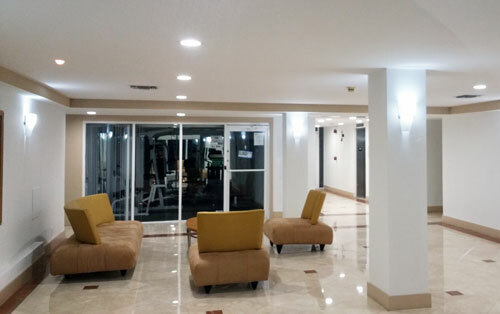 My employees are very gratefull for the big change, they work under better lighting conditions and also will be a big saving for me on the electrical bill, Every body wins. Thank you very much and here are some of the pictures of the work done. By the way, I use my phone to watch the warehouse and I can now see much better. 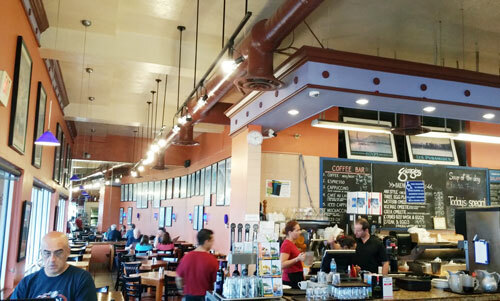 Replaced 8 foot tubes 75 watts with 36 Watt 8 Ft LED T8 Tube. 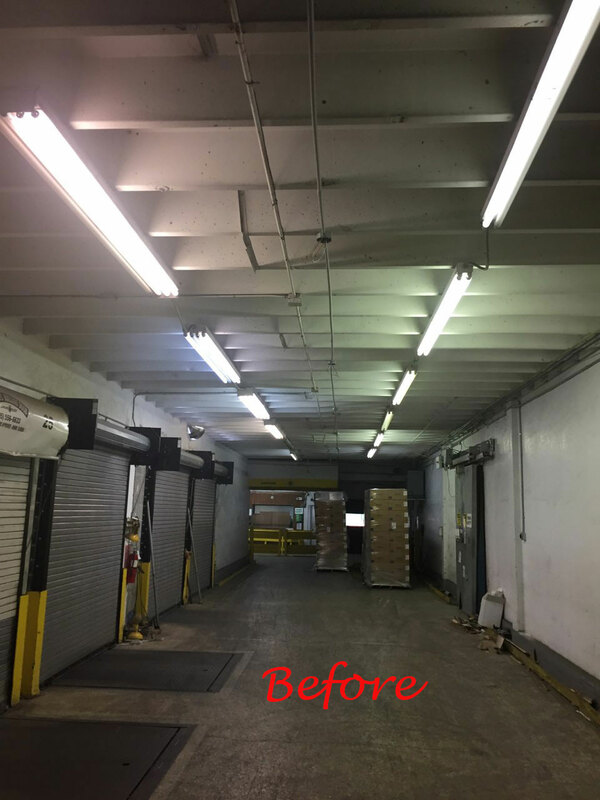 This big warehouse was iluminated by 400 metal halide and fluorescent tubes (8 footers) By retrofiting they achieve a safer working environment and a happier workforce. Electric bill has diminish. 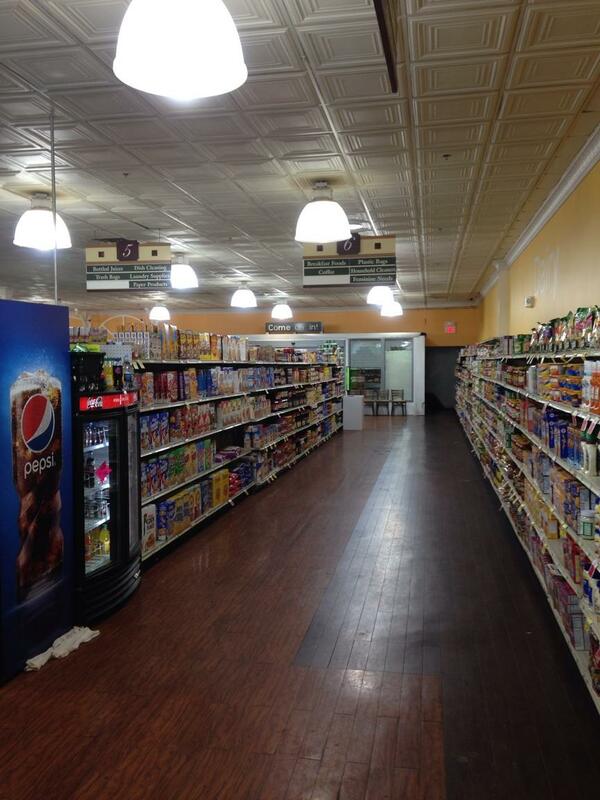 8ft LED Tubes, and 120 W Corns bulbs, IP 40 were the replacements used in this locatioins. Using 8 footers LED tubes and 120W LED Corn Bulbs. 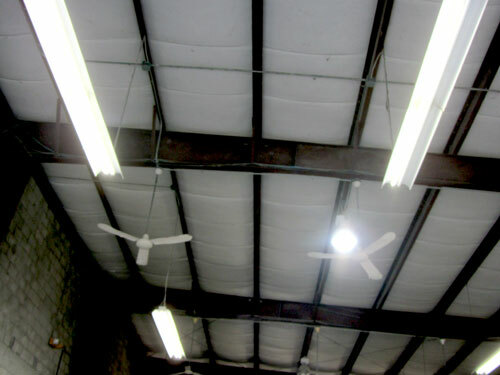 This company, located in Opaloka, FL, (this is their website) needed better lighting and a lower electricity bill for its warehouse . 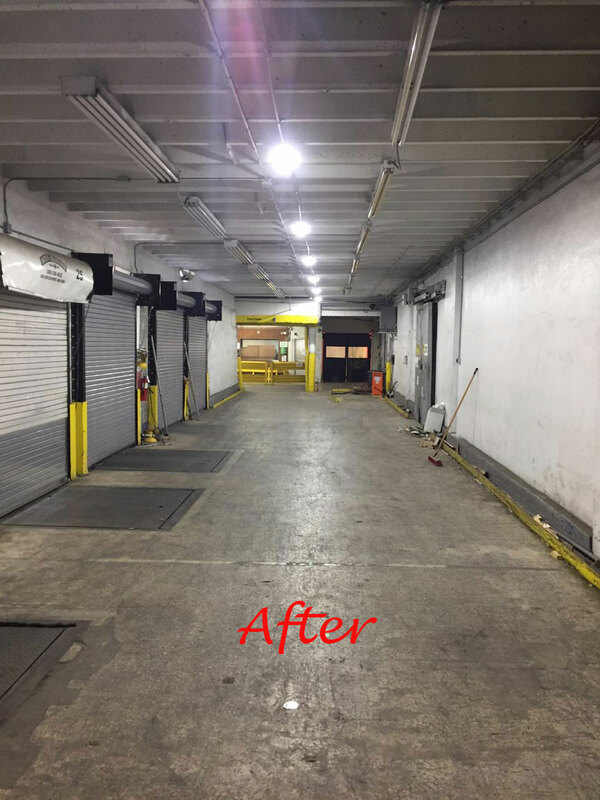 They were using 45 High Bay shades with 400 Watts Metal halide bulbs each and we replaced them only with 23 of our 200 Watt Linear High Bay Fixtures. 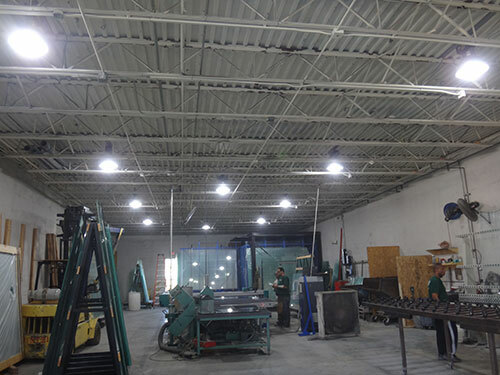 "After we factored the 2 meters we have at our current facility, we are saving roughly $350.00/ month. 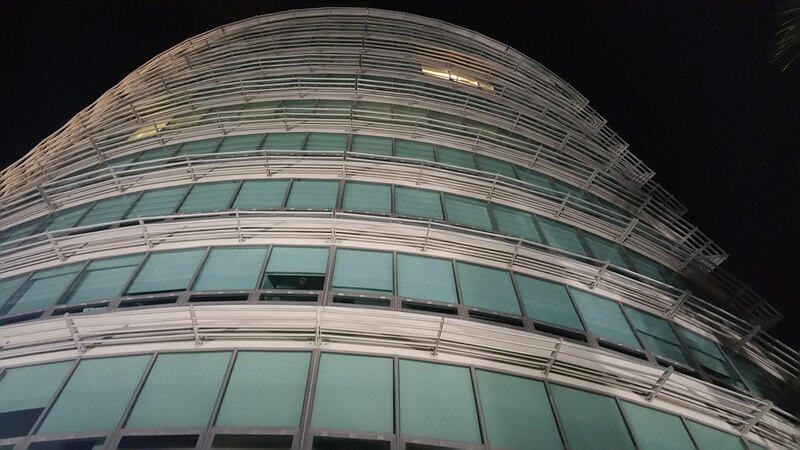 Coupled with the savings we should also count that we have better lighting distribution/quality and a significant reduction in the heat produced by the fixtures." 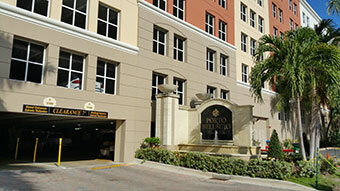 This condo buliding is located in Treasure Island, North Miami Beach. 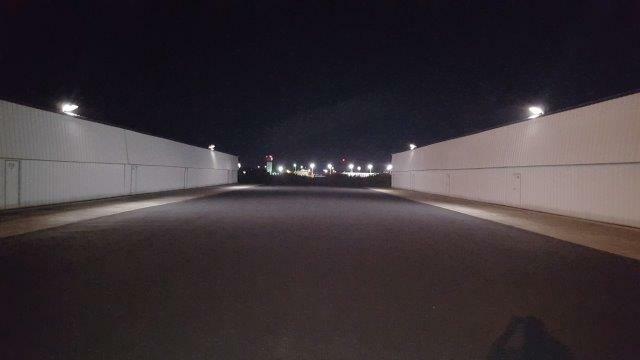 For the parking lot area, on the left 50 Watt IP66 LEDRadiant Flood Lights, on the right, the wall packs 250W Metal halide bulbs were replaced with 36 Watt IP64 LEDRadiant corn bulbs. Same corn bulb was used at the pool globes. 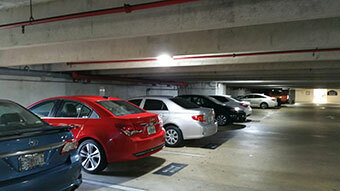 In the entrance all CFL bulbs were replaced with LED Plug type lamps according to the base type and color temperature. 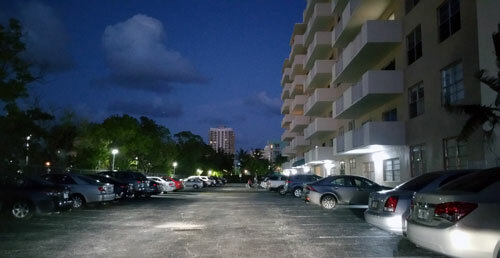 For the Parking lot, the 400W Metal Halide bulbs were replaced with 54W IP64 LEDRadiant corn bulbs. 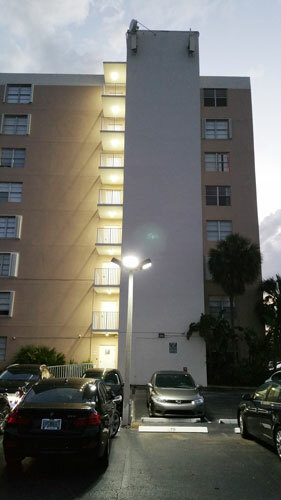 For the balconies they have installed 30w LED Linear Lighting Vapor Tight Light Fixture. 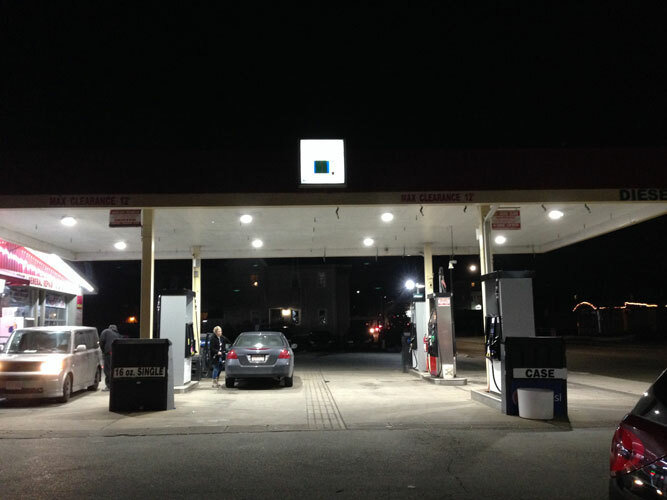 John thank you very much for excellent service. 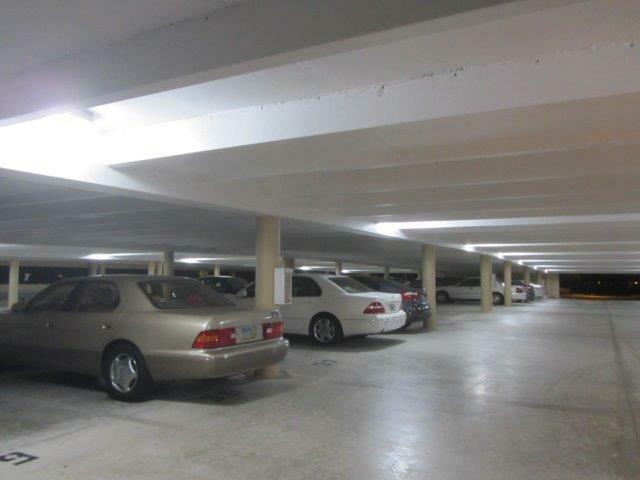 We are experiencing 75% savings in the electric bill for our parking garage. Our board cannot think of a better investment and at the same time improvement. 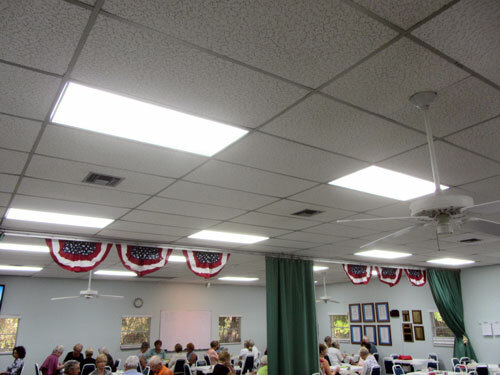 We replaced 175 watt metal halide with 36W LED Corn Bulb. Even though the bulb is rated 175 watts, including the ballast consumption we were using over 200 watts and now only 36. 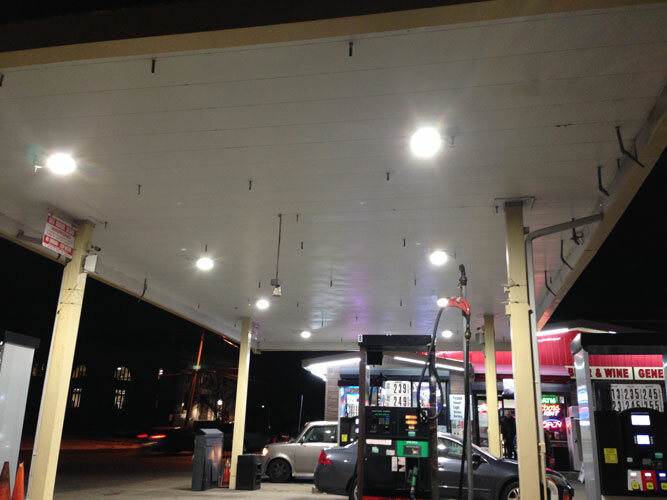 Retrofitted 458 canopy fixtures using 175 Watts metal halide bulbs with 36W LED Corn Bulb. Our electric bill went from $12,500 to $7,200 even though we still have 1800 CFLs to replace that work 24 hours a day in the hallways. 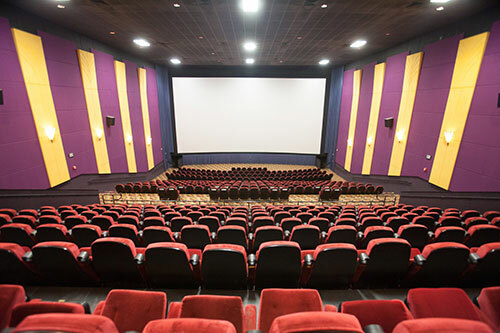 We will be replacing those soon. 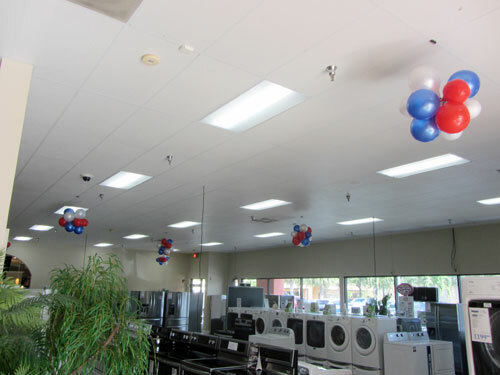 For the re-ignauguration of this store, the owners decided to get rid of the old fluorescent tubes and replace them with the 2200 lumens emanating from each of the 18 w LED 100% plastic lighting tubes used as a replacement! Using a 18W plastic LED tube. 5000K was the color temperature choosen. 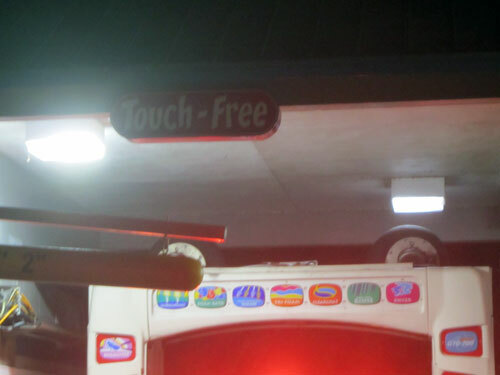 Light equals sales. The more you have of one, the more you get of the other one. 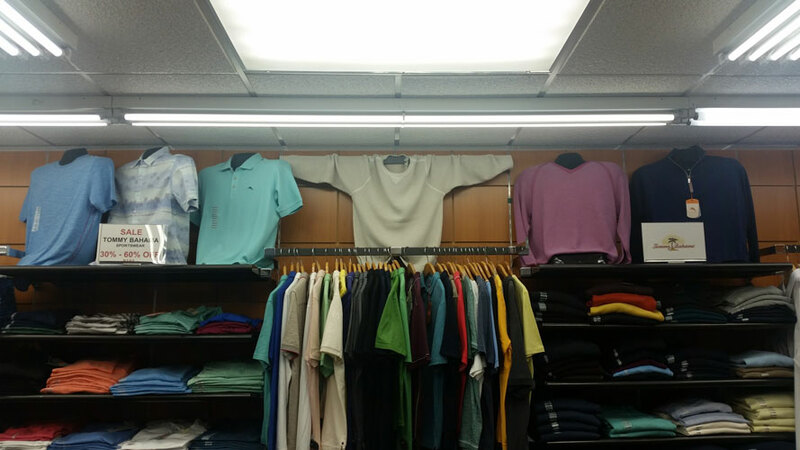 That's why at Garage Clothing (Brookling, NY) decide to switch to LED. 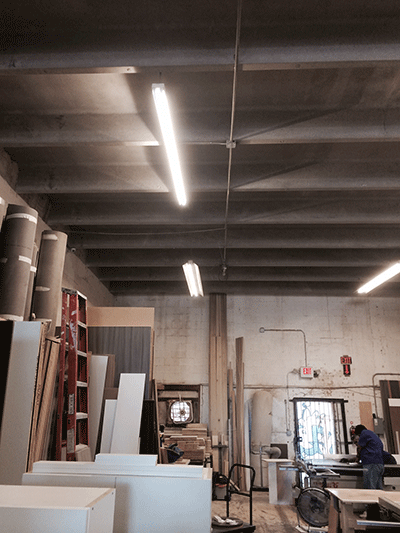 They had 8 ft fluorescent tubes and they replaced them with our 36W 8 ft LED tube. 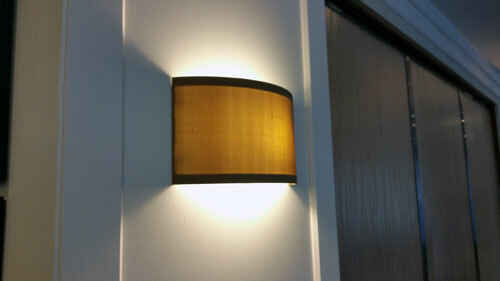 Color temperature: A beutifull natural white, 5000K. 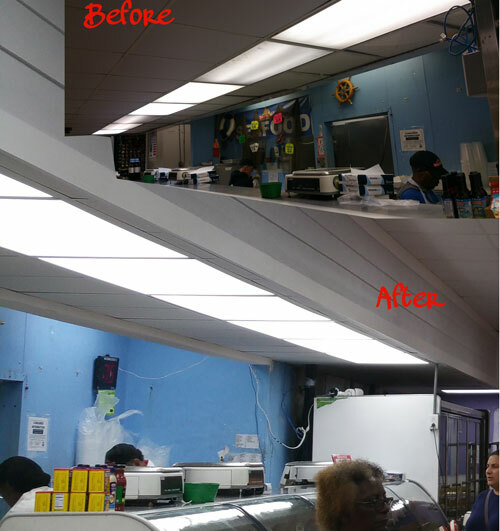 Replaced old canopy fixtures with 250 Watts metal halide with 75W LED Canopy Light Ceiling Mount: 5000K 8800 Lm UL IP65 DLC. 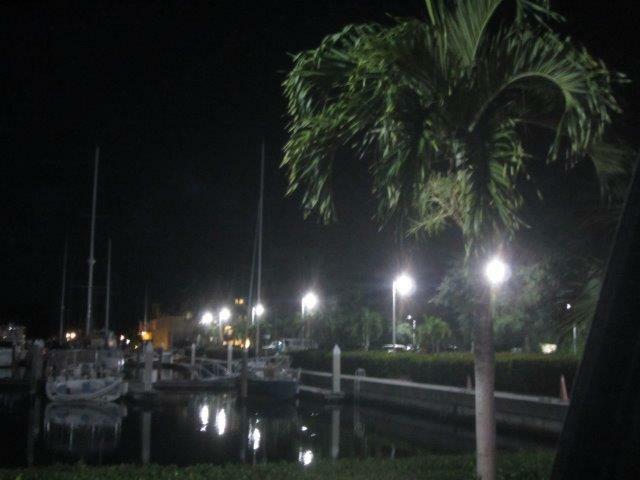 Even though the bulb is rated 250 Watts, including the ballast consumption we were using over 300 watts and now only 75. 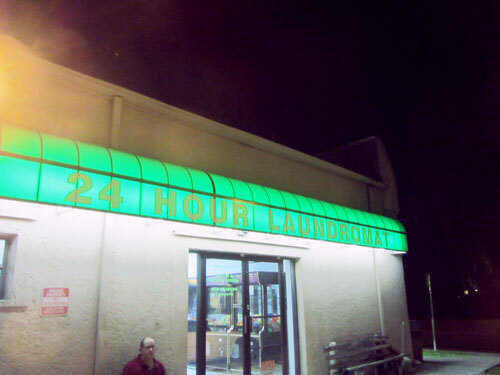 This 24 Hs laundromat had, Inside and outside, old 8 foot fluorescent tubes that were replaced with our 8ft LED tubes. In this case, with a color temperature of 6000K. 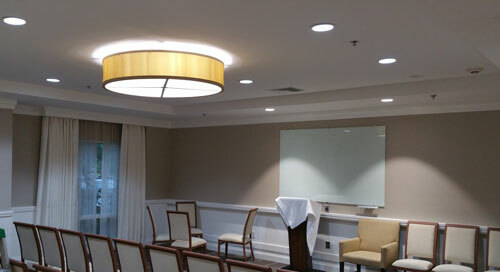 Lighting was almost duplicated and savings in the electric bill were unsurpassed. 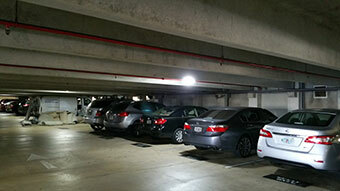 Replaced 250 watt metal halide bulbs with 45W LED Corn Bulb. 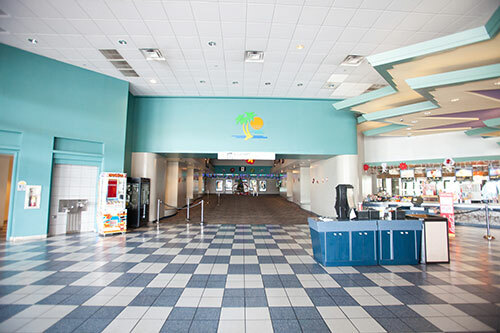 The place shines like never before, with the same color everywhere and most important our maintenance went form $1,500 a year to nothing.